Sunday, I attended the final Slow Food Nation session at the taste pavilions. I tried pluot gelato and Hell or Highwatermelon wheat beer. I enjoyed a beer with honey flavor and honey infused with coffee. And I sampled coffee I was told had cannabis ‘notes’ and cannabis with–kidding!! I chuckled a bit when I saw there was a snail butter cooking demo, but that made a little more sense once I remembered that the snail is the logo of the Slow Food movement. 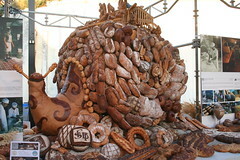 Speaking of snails, a five-foot tall monopod made from loaves graced the bread exhibit. I’m not sure whether the bread was coated with formaldahide or something else, but let’s just say those were not among the loaves donated to the hungry at the end of the night. 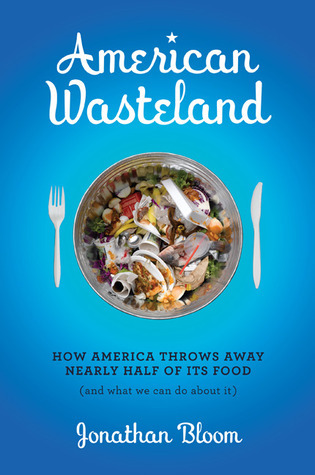 Which brings me to the point: After enjoying the event, I volunteered with Food Runners to help funnel excess food to the homeless. As is always the case with donations, there was more bread than you could imagine. There was actually more bread than we could take because Food Runners operates by sending volunteers in their cars (or sometimes on foot in pedestrian-friendly San Fran). That night, we were cramming everything into a 2007 Toyota Corolla. Slow Food USA and the individual food purveyors were quite generous. After a little debate over whose food it was to donate and an accompanying wait, we received a nice haul. 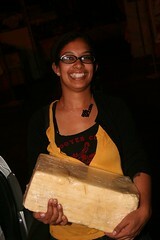 There were two boxes of salami and other high end cold cuts, a crate of farmer’s cheese, a box of pluots, two vats of pickles, more bread than we could take and the biggest block of cheese I’d ever seen (that’s Emily Saex, 22, struggling to hold it up). And the funniest bit of fellowship came toward the end of the night. The fish pavilion had a bit of excess. So one of their generous staffers came over to the coffee area, where some folks and I were sharing fancy chocolate and sipping our fairly traded espresso. “Sardines, anyone?” There were no takers. All in all, there was a great spirit of sharing, both with Food Runners and fellow staff. My favorite example occurred after all the paying customers had filed out (and set up shop in the beer tent). The kind souls at the ice cream pavilion put out a rolling cart with six tubs of gelato. Let me assure you–that gelato did not go to waste and there was nothing slow about it. This entry was posted in Events, Food Recovery. Bookmark the permalink. Both comments and trackbacks are currently closed. Sounds like a fun time was had by all. I wish i could have been there.